A staggering 80% of cable costs can be attributed to raw material alone. Cimteq arrives at this estimate with some 20 years’ extensive knowledge of cable design and software manufacturing. Reducing the cost of cable production is therefore key in maintaining profitability. And the starting point is cable design. Cimteq’s CableBuilder software manages the complete cycle of cable design and manufacture through typical workflow milestones of Design, Customer Quotation, Ordering, Production, Quality Assurance and ERP system. 1. Accurate costings – Housing key product and pricing in spreadsheets alone is difficult to maintain. Too much information and too many versions easily lead to mistakes that impact the bottom line. – captures the intellectual knowhow of key staff so that product knowledge can be accessed regardless of annual or unexpected leave. 2. Reduces waste – CableBuilder supports the production of a ‘digital twin’ through complex algorithms which have been built by its inhouse team. This allows design engineers to quickly and accurately cost different models before committing to the expense of manufacturing – significantly reducing waste as a result. 3. Automates labour-intensive tasks – Design engineers and commercial staff alike value CableBuilder for its support on time-consuming tasks. All calculations and costings are entirely configurable, which allows for both rapid design and rapid customer response. Reporting too is fully customisable with outputs in Word, Excel and pdf and in any chosen language. CabWire 2019 was held at Southampton University on 2nd and 3rd April 2019. Hosted by the International Wire and Machinery Association (IWMA), the conference included Training Fundamental Workshops by ferrous and non ferrous speakers on subjects including an introduction to armouring, fire performance of cables, steel wire drawing, an introduction to galvanising, an introduction to induction heating and dies for copper & aluminium wire drawing. Amanda Shehab, Director of Cimteq and IWMA Technical Committee Chairman opened the conference on 2nd April, followed by a key note speech from Marcello Del Brunna, CEO of Prysmian UK. There was a tour of the Tony Davies High Voltage Laboratory lead by Dr. Thomas Andritsch, a lecturer at the University of Southampton, where delegates were shown around the laboratory and watched high voltage demonstrations. Ali Shehab, CEO of Cimteq, presented on “An Introduction to Automation Systems”, talking about The Smart Factory and Industry 4.o and its impact on the wire and cable manufacturing industry. The evening was held at the impressive National Motor Museum where delegates toured the museum with its eclectic range of cars on show including the famous Bluebird driven by Donald Campbell, Chitty Chitty Bang Bang, Formula 1 racing cars and Harrods and Royal Mail postal vans of times gone by. The 3rd April included an exclusive tour of The Prysmian Factory in Eastleigh, Southampton where delegates were shown their customer centre, telecom factory and special cables factory. The IWMA considers that one of its primary functions is to promote education and growth within the wire and cable industry and the aim of its back-to-basics workshop sessions was to provide information on the manufacturing process best practices for those attendees new to the industry, as well as those more experienced attendees keen for a refresher. CableMES is an innovative custom-built manufacturing execution system (MES) which leverages the global scaleability of the Wonderware platform together with Cimteq’s extensive advanced manufacturing knowledge. The result? An MES designed specifically to meet the needs of the cable manufacturing industry – and with an immediate impact on bottom line. A bold claim perhaps that investing in CableMES secures such a quick return on investment. But it is a claim evidenced by the immediate impact of the software on maximising plant production, improving product quality, reducing inventory and ensuring on-time delivery. Effective management of resources starts with accurate production orders, taking account of customer order dates, length, availability of stock and manufacturing production capabilities. As CableMES integrates seamlessly with CableBuilder’s manufacturing module, production orders can be generated automatically on demand. The resulting production order includes all necessary production information needed to execute the order. Paperwork and manual entry are instantly reduced by CableMES’ ability to download machine settings and quality plans direct to the machines. The immediate benefit to warehouse management is as much about data integrity and accuracy as it is saving time. Operators can quickly and accurately set up machines, assign materials and track progress through barcodes and virtual warehousing. Barcode tracking of stock movement and availability provides greater visibility to the factory manager, not only to accurately manage stock by location or item but also for full traceability of raw materials to the shipped product. CableMES’ integration with the world’s leading finite capacity planning tools including Ortems and Preactor ensure that delivery problems are identified before they occur and expedited to hit target dates. CableMES’s supervisory system provides real-time visibility of the shopfloor, production order sequencing and batching and drum and raw material management which allows work in progress and production capacity to be robustly tracked. Users can create tailored dashboards of their area of responsibility which allows them to manage production issues from a single screen. Automated quality recording and real-time alarms allow immediate response to address any non-conformance issues and analyse quality losses, which in turn supports long-term Overall Equipment Effectiveness (OEE). CableMES utilises Wonderware’s powerful Historian tool which allows process data to be correlated with process and quality alarms to an exact length of cable produced. This helps to identify trends and provide long-term improvement benchmarks. Bespoke reports allow management to take a strategic view of the business and to drill down to the cause of any event. As well as integrating with any ERP system of choice (including SAP, CableERP and BPCS), CableMES fully integrates with CableBuilder to provide the most robust application of its kind for cable manufacturers across the globe. Cimteq is proud to once again support the Interwire exhibition which takes place this year 14 – 16 May at the Georgia World Congress Center, Atlanta. The event is hosted by the Wire Association International (WAI), a society founded almost a century ago to bring together wire and cable industry professionals across the globe. Ali Shehab, CEO, Cimteq, will be amongst the prestigious line-up of speakers who will be sharing their insights into the changing face of cable and wire on 15 May from 09:00 – 10:00, as part of the Operations Innovation Panel. He will be joined by Andy Talbot, Vice-President, Mid-South Wire, Dave Hawker, Vice President, Nexans, Richard Wagner, Vice President, Insteel Wire Products and Tom Heberling, Senior Vice President, Southwire. The theme of the Interwire 2019 conference is ‘Next Generation’. For Cimteq, the future is already here with the concept of Industry 4.0, otherwise known as the ‘Smart Factory’. Following the panel discussions, Cimteq and its partner InnoVites will be hosting the technical programme on Industry 4.0 and the Smart Factory. This workshop will explore how to best implement the use of smart assets in a factory – not only by adapting working practices but also adapting mindsets in communication, continuous improvement and collaboration. Cimteq is also the sole sponsor of the Georgia Tech Advanced Manufacturing Pilot Facility Tour. Designed to help mould a new generation of cable experts, the tour takes place during the exhibition. A larger expert team from Cimteq will be on hand at the exhibition to demonstrate how Cimteq’s cable design and manufacturing software can support the switch to a Smart Factory. CableBuilder was conceived some 20 years ago to meet the demand within the cable manufacturing industry to simplify the complex management of cable design data. It supports this process from the initial design concept all the way through to delivering the full bill-of-materials directly to the ERP system. Customers report the ability to maintain competitiveness through three key benefits: accurate costings, waste reduction and automation of labour-intensive tasks. CableMES – sister product to CableBuilder – was developed as a Manufacturing Execution System (MES) specifically for the wire and cable manufacturing industry. By maximising plant production, improving quality, reducing inventory and ensuring on-time delivery, it is able to achieve a very quick return on investment. For a free conference pass or to book your personal demonstration of CableBuilder or CableMES please email Katy Harrison, Marketing Manager, Cimteq, katy.harrison@cimteq.com or visit us at booth #1607. Cimteq, leading worldwide provider of software solutions specific to the cable manufacturing industry, has appointed a new Development Manager to drive improved product quality through the introduction of Agile working processes into the business. Rob Cox joins Cimteq with over 20 years’ practical experience working in the software industry. He brings with him a wealth of IT and software development knowledge, which he has gained in a variety of roles including development, testing, project implementation and project management, working across a wide range of sectors. Rob will be responsible for the ongoing development of Cimteq’s software products and the management of the development team. He will drive company-wide quality improvements, and define and manage its business processes, methodologies and working practices. Commenting on Rob’s appointment, Robert Douglass, Operations Director at Cimteq explains: “We are delighted to welcome Rob on board as our Development Manager, he brings a wealth of IT experience covering all aspects of the development lifecycle and project management. His appointment will oversee Cimteq’s transition to an Agile methodology and the inherent business benefits that this will bring. Cimteq offers software solutions to the cable manufacturing industry. CableBuilder is designed to meet the demand within the cable manufacturing industry to simplify the complex management of cable design data. It supports this process from the initial design concept all the way through to delivering the full bill-of-materials directly to the ERP system and provides accurate costings, waste reduction and automation of labour-intensive tasks. CableMES was developed as a Manufacturing Execution System (MES) specifically for the wire and cable manufacturing industry. By maximizing plant production, improving quality, reducing inventory and ensuring on-time delivery, it is able to achieve a very quick return on investment. CabWire Training Fundamentals Workshops will be held at Southampton University in the UK. Southampton is ranked 6th in the UK for it’s Physics department where they conduct research in high voltage cable systems, these projects typically involve modelling and/or physical testing of cable systems, to determine their thermal, electrical or mechanical behaviour. The workshops will include Ferrous and Non-Ferrous Fundamentals and Ali Shehab, CEO, Cimteq will be hosting a workshop on an “Introduction to Automation Systems”. Other workshops include Steel Wire Drawing, Dies for Steel Wire Drawing, Wire Rope Stranding, Introduction to Induction Heating, Copper & Aluminium Wire Drawing, Stranding of Copper & Aluminiun, Fundamentals of Extrusion, Introduction to Armouring, Dies for Copper & Aluminium Wire Drawin, LV Cable Design and Optical Cable Manufacture. CabWire will also include a tour of the High Voltage Lab at Southampton University, a Q&A session with all guest speakers, an evening networking event at The National Museum and a tour of The Prysmian group – the largest manufacturer of cables in the world. Ali Shehab, CEO, Cimteq, will be joining a prestigious line-up of speakers within the cable industry’s most influential companies at Interwire 2019, May 13-16 2019, at The Georgia World Congress Center in Atlanta, Georgia. Amongst the speakers is, Andy Talbot, Vice-President, Mid-South Wire, Dave Hawker, Vice President, Nexans, Richard Wagner, Vice President, Insteel Wire Products and Tom Heberling, Senior Vice President, Southwire. The conference provides a platform for delegates to hear and see what manufacturers are talking and doing about the next generation of wire and cable making. Ali Shehab will also be hosting a Technical Program on The Smart Factory during the 5 day conference. Ali Shehab says ” Using Smart assets in your factory does not make the factory a Smart Factory, in the same way a Smart phone does not make the person Smart. A Smart Factory must exhibit the characteristics of communication, adaptability, continuous improvement and collaboration. Industry 4.0 is not the future, it is here and yielding benefits by those that adopt its concept”. Interwire includes WAI’s 89th Annual Convention; its 3rd Global Continuous Casting Forum; a full exposition in Hall A; and a collocation of the International Fastener Manufacturing Exposition (IFME). For more information or to attend the conference as a guest of Cimteq, please contact Katy Harrison, Marketing Manager, Cimteq, katy.harrison@cimteq.com. Happy Christmas from all of us at Cimteq. We thank all our customers and partners for their continued support. During the Christmas break, Cimteq will be closing the office from 1pm on 24th December 2018 and re-opening on Tuesday 2nd January 2019 at 9am. Cimteq hosted a Christmas party with a difference this year on Saturday 8th December at Whitewater Active in Llangollen, Wales. Katy Harrison, Marketing Manager at Cimteq says ” We fancied hosting a party with a difference and decided to go for something a little more adventurous. 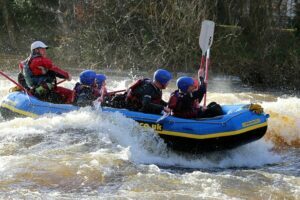 The team were offered a choice of 2 activities, including white water rafting on the river Dee in Llangollen or archery. The team that opted for white water rafting were certainly offered an adventure not to be forgotten. As it was December, the water was extremely white due to heavy rain the previous few days. The instructors were very thorough in terms of their safety briefing which had to be conducted in a field prior to hitting the water due to the ferocity of the river. Once we hit the water, it was an adrenaline fuelled ride from start to finish. 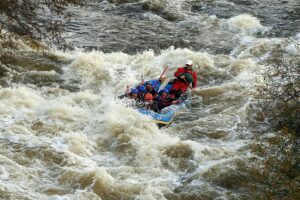 There was one scary moment when we lost the CEO over board but thankfully he was rescued before we lost him down river. 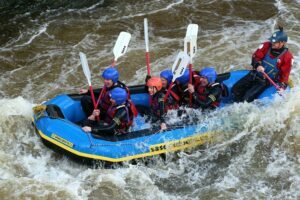 It was an excellent experience and we want to thank the team at Whitewater Active in Llangollen for looking after us so well. I thoroughly recommend this for a corporate team building exercise”. The events were followed by a three course Christmas lunch at The Cornmill in Llangollen where the team enjoyed the rest of the day in a more relaxed environment, overlooking the River Dee where we had previously flown past in the morning.